Belugaria is from Essie's Encrusted Treasures Collection, which is a holiday set for 2013. This is the only polish I got from the collection since I found all of the others pretty 'meh.' 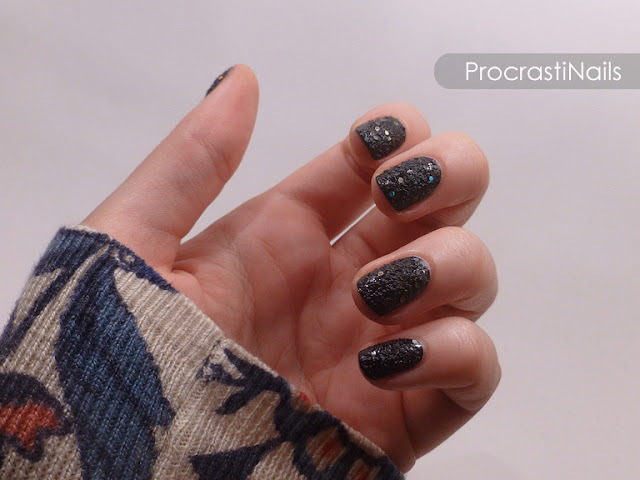 It's described as a "holographic jet black lace." Lace? Lace? Does this scream "lace" to you?! Hahah. How odd. I've read this is supposed to be a play on the caviar look from a few trends ago (get it? the name is a play on Beluga Caviar... yes, I had to look that up.) 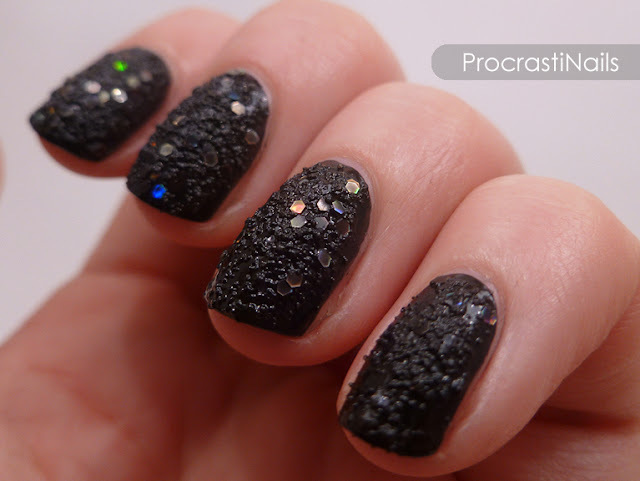 but I think it just looks like any other textured polish, plus some awesome large holo glitter. Like I said earlier, I HATE applying this polish. I have to fight to get colour to the edges of my nails, because the polish is so encrusted with texture and dries fairly quickly. My trick to get around that is simple: black undies! For these swatches I started with a single coat of Sinful Colors Black on Black (it doesn't matter if it's streaky, it's going to be covered anyway) so that I didn't have to worry so much about getting the base colour around the edges of my nails. Worked like a charm! All pictures displayed here and elsewhere on my site (unless indicated) is my intellectual property and Copyright © ProcrastiNails 2013. Please do not link/re-host elsewhere without asking. Not sure how I feel about this polish. 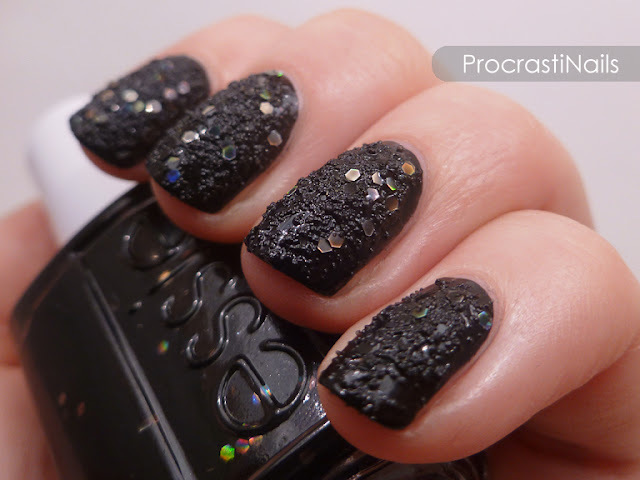 It reminds me of crushed Oreos, not exactly something I want on my nails. But it is different than anything else Ive come across. LOOOOOOL! It totally does. But I love Oreos, so maybe that's a good thing? :D It's funny you mention that because I just saw a post earlier about how to make Oreo Butter and all I could think was "well, that's different I guess..."
I love the holo glitters, but I feel like the texture might be a little TOO much... I guess it's probably a little less textured than it seems from the macro photos. Definitely a very interesting polish! 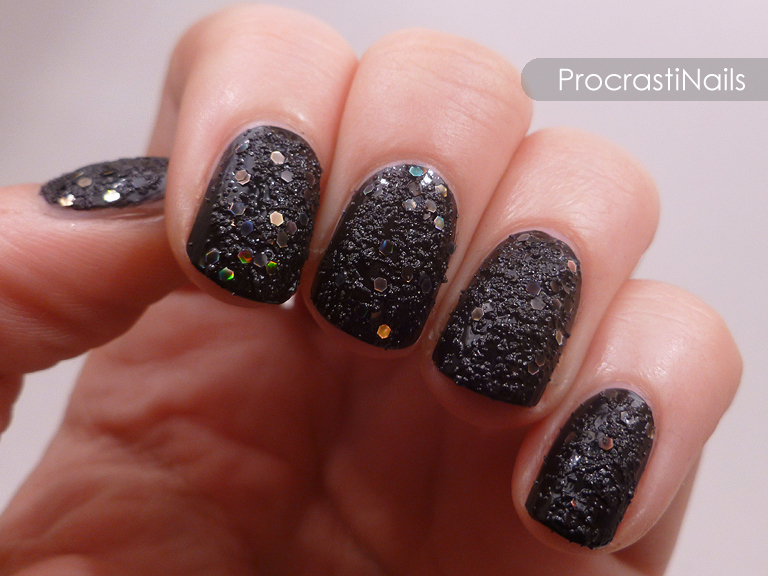 this is such a beautiful polish, And I love the texture on your nails! I can never get enough of textured polishes. :) This is one of my favs, for sure. It reminds me of diamonds encrusted in volcanic rocks, and I think that was the idea behind it with all the texture within it and the holo glitter. It really calls out the "encrusted treasure" motto. Kind of an extreme polish, but SO UNIQUE!!. You either love it or hate it. At the moment I am loving it because of how "high fashion" it looks. It definitely is unforgettable.